green sits the audience on stools that fully rotate in order to take in the elevated walkway that lines the whole of the studio space’s walls. Blank chalkboard walls and florescent lighting evoke a school – a place of entrapment, discontent and opportunity. It’s also the place where we first experience attraction and carefully negotiate it amongst the tumultuous landscape of teenage hormones and popularity contests. Love within this context feels all the more precarious, and the performance becomes demonstrative – we are meant to listen, and learn patience and empathy from the examples set before us. It’s not patronising though, and we won’t get in trouble if we don’t do our homework. 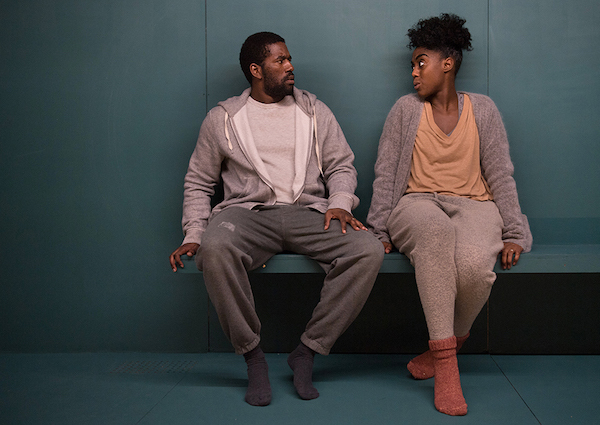 Characters A (Lashana Lynch) and B (Gershwyn Eustache Jnr) drive the generation-spanning, episodic story with intimacy and pathos as well as convincing vitriol that comes from knowing someone inside and out, for years. The rest of the cast capture similarly vibrant emotional lives and moments that are all too familiar to anyone who has ever been in love. All five performances are excellent. The play’s power lies in presenting widely relatable themes within generic characters (albeit heterosexual ones) across three generations, making them unobstructed conduits to the audience. The universality placed within a pedagogically-inspired set fosters openness and vulnerability in both the actors and audience, making this a particularly communal experience of the profundity and heartbreak that comes with having a profoundly affectionate, passionate devotion to someone (-noun). a profoundly affectionate, passionate devotion to someone (-noun) runs through 1 April 2017.